Posted on 7.8.2007 at 14.07. After two weeks in the country I have now been back in Helsinki for a week. The peaceful country living was such an energy boost that I’ve decided to go back soon for one more week as my summer holiday is now continuing. During our time in Joensuu we had no internet access and maybe looked at our phones once a day. It felt so good to be disconnected for a longer period of time! 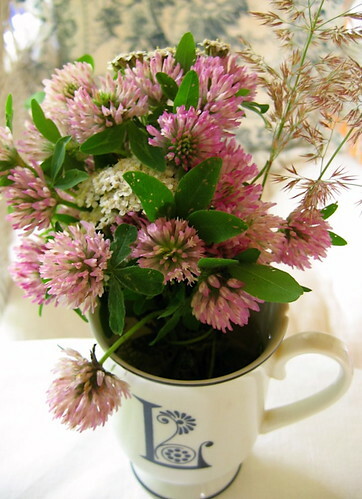 Pink clovers on the veranda. The weather was so great that on many occasions I just rolled out my beads on the garden table and sat in the sun, making whatever came to my mind, which was extremely relaxing! I made several bracelets, necklaces and earrings that I’ve now been trying to photograph here at home. I’ll upload them on Flickr one by one during today and tomorrow before I get out of town again. 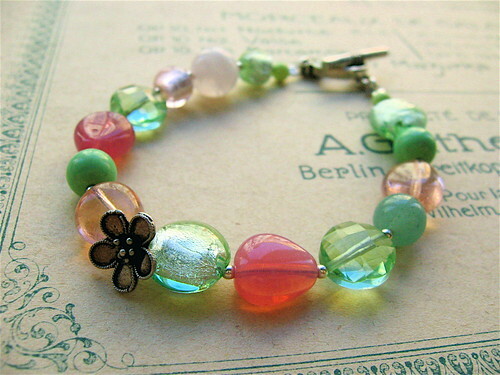 “Morning rose” with silver foil and pressed glass, second hand Swarovski crystals,rose quartz, green aventurine,green chalk turquoise and silver flower & clasp. 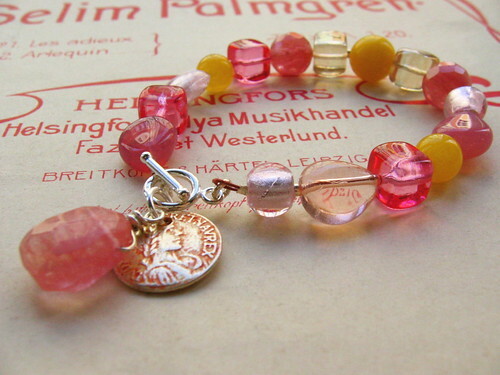 “Cesar’s pink explosion” with silver foil and pressed glass, strawberry “quartz” glass, yellow jade and a silver clasp. The metal coin charm is from Barcelona. 😀 I’m laughing here slighly ’cause I share your dislike to pink… wouldn’t believe it looking at my jewelry, would you! But as I began to add pink to my necklaces first, I grew to almost like it as well. -Specially the ‘Morning rose’ is very charming and fresh!